Professor Derek Paley Publishes New Book! 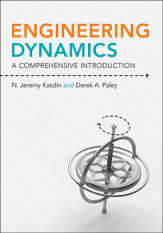 Dr. Derek A. Paley, Assistant Professor in the Department of Aerospace Engineering, has co-authored an undergraduate textbook with Princeton University Professor Jeremy Kasdin. The textbook, entitled Engineering Dynamics: A Comprehensive Introduction, is been published by Princeton University Press. It introduces engineering students to dynamics using an innovative approach that guides them from the basics to increasingly more challenging topics without sacrificing rigor. The textbook features numerous real-world examples and problems and ample use of MATLAB for solving problems. Dr. Paley is the director of the Collective Dynamics and Control Laboratory and has more than 45 peer-reviewed publications in the areas of motion coordination of autonomous vehicles, spatial models of biological collectives, and adaptive sampling of spatiotemporal processes. Paley is Associate Fellow of the AIAA and received the NSF CAREER award in 2010. He currently teaches introductory dynamics (ENAE 301), advanced dynamics (ENAE 788G), and nonlinear control (ENAE 743). For more information on Professor Paley's new book you can visit the publisher's website.